I want to share an exciting new cross that I'm about to start working on. In two weeks, my church (www.christ-umc.org) is getting ready to open its brand new sanctuary. Once the services are moved to the new sanctuary, the entire old sanctuary building will be used for children's ministries. There are lots of exciting things planned for the kids . . . but probably the most exciting is Big House. Big House is the name of the new Children's Worship service for Kindergarteners - 6th graders. The service will be structured similar to the basic adult service . . . except be geared toward kids. So . . . more upbeat . . . more singing . . . more visual interaction . . . but still in a respectful, worship-oriented setting. How cool is that? I think it's exceptionally cool and I know the kids (including my own little monkeys) are going to LOVE it. 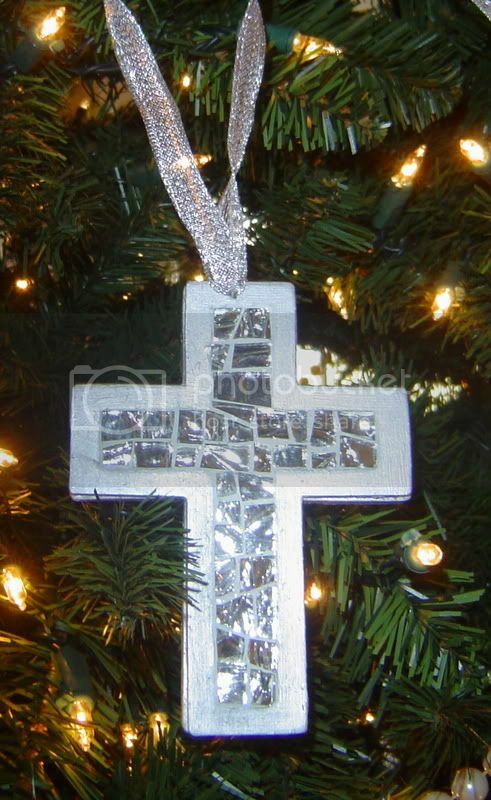 I'm really excited and feel very blessed to have been asked to design a special cross for Big House. The cross will sit on the altar and be an ever present visual reminder of God's love and grace for the kids. I'm still working on the design so I can't share exactly what the cross is going to look like. But I can tell you that it's going to be BIG (probably about 2.5' tall) and vertical (sit in a stand). 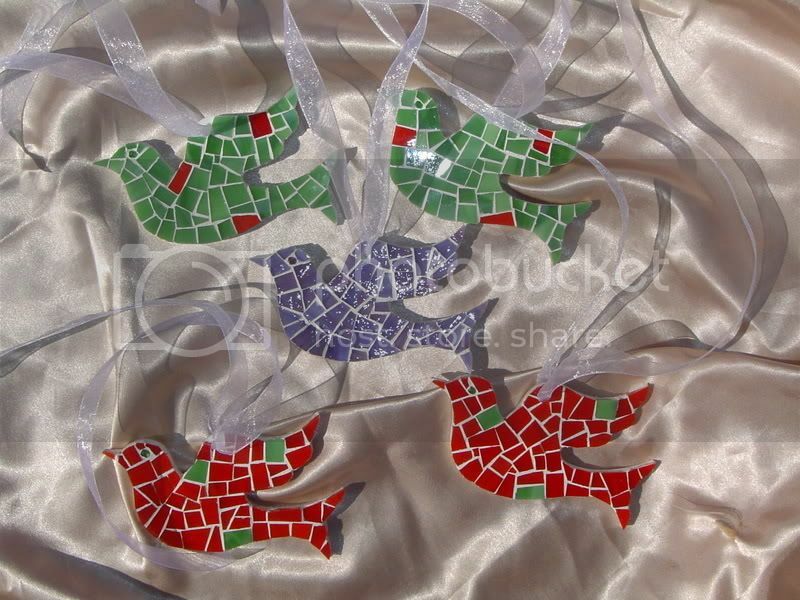 It predominantly will be jewel tones and I'm thinking of using a lot of mirror glass. As of right now, the design will be more free-flow than a true, structured design . . . but all of that could change as God hasn't really told me what He wants yet. Or maybe I just haven't listened. I have that problem sometimes. HA! Either way, it's clearly a work in progress and I plan to share the progress with you. The first thing I need to do is have my dad build the base for the cross. I hope to have this by mid-March. 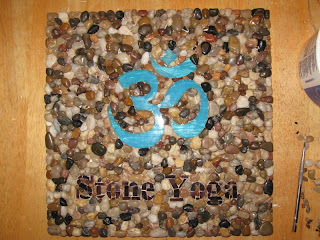 In the meantime, I'm going to work on the design and find the perfect glass to use. Stay tuned for the updates . . .
Just a quick post to share two new crosses. The crosses are gorgeous but the really cool thing about them is that they were ordered by somebody who received one of my crosses as a gift. I always love the opportunity to hear what people think about their cross . 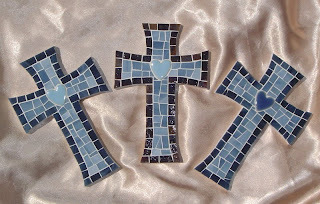 . . and I *especially* love the opportunity to create crosses for them to give as gifts. It's such a blessing to me! Without further ado, here they are. 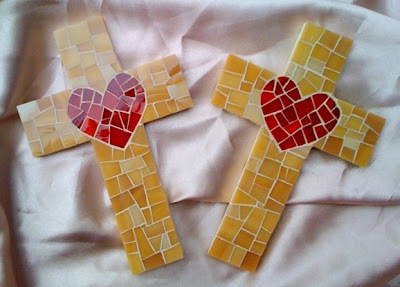 The design is the same for both ~ red pieced hearts with a caramel background on my smallest (4" x 6") cross base. They are grouted in Bone. Be sure to stay tuned for my next post about the exciting, BIG cross I'm designing and making for Big House! OK ~ so it's been a really, really, really long time since I last blogged. I wish I had exciting stories from a big adventure to share but alas, I can really only blame my fairly tame life for keeping me from my blog. Somehow, in the midst of raising 3 small monkeys, practicing law and handling whatever else life throws at you, the blog fell by the wayside. 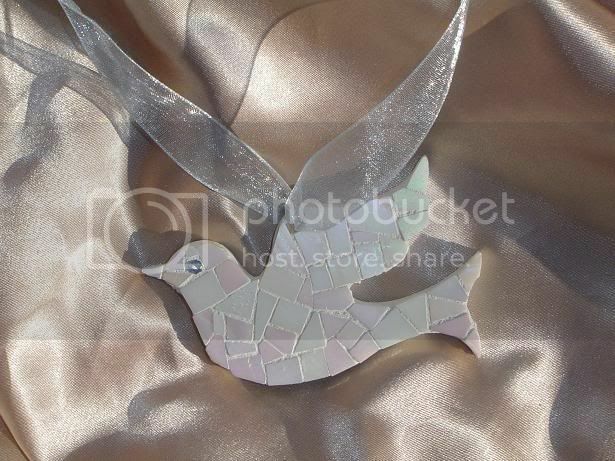 The good news is that I am still mosaicing. Not quite as much as before but I could never give it up. So ~ it's my February 17th resolution to start blogging again and share my artwork with you. I hope you'll enjoy it as much as I know I will.